Rosemary qualified as an adult nurse in South Wales in 1980, working for a short period in orthopaedics before undertaking a midwifery course in Swansea. Following 8 years as a hospital midwife, she started working as a community midwife in the South Wales Valleys area from 1990. 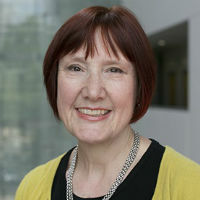 Between 1997 and 2002 she was one of two Midwife Members for Wales for the United Kingdom Central Council for Nursing, Midwifery and Health Visiting (UKCC) that was the forerunner of the Nursing and Midwifery Council (NMC) and she continued as a practitioner panellist with the NMC from 2003 to 2008. Moving to London in 2004 Rosemary commenced work as a midwife in Newham where she stayed for 6 months before undertaking the BSc in Public Health at City University, qualifying as a health visitor in 2005. Having worked full time in Spitalfields and Bethnal Green until August 2014. Rosemary's areas of expertise are: safeguarding children, breastfeeding, prescribing and professional regulation. The Baby Friendly Initiative (BFI) Lead for the Specialist Community Public Health Nurse (SCPHN) BSc/PGDip programme, she has worked with her team to achieve successful Unicef UK accreditation of the programme (health visitor route) in July 2018. Marx, R. (1996). Providing Continuity of Care by Community Midwives. In Bryar, R. and Bytheway, B. (Eds. ), Changing Primary Health Care (pp. 181–191). Oxford: Blackwell Science. Teaching on Specialist Community Public Health Nurse (SCPHN) BSc programme. (Modules: Evidence for Practice and Public Health and Society). Specialist areas: Safeguarding and Child Protection, Professional Regulation, Breastfeeding, Perinatal Mental Health. Facilitates an Action Learning set supporting the Specialist Practice Teachers from the Community Trusts where students are placed (Barts Health, Homerton, and Newham). Rosemary was a Baby Friendly key worker in the Barts Health Health Visiting Service between 2009-11 and contributed to the successful award of the Unicef UK Baby Friendly accreditation in December 2011. She now has the Lead to work towards the Unicef UK Baby Friendly accreditation of the City University SCPHN programme. Has a role as personal tutor (link lecturer) for students in their community practice placements.